I get a lot of good traits from my dad: a good head of hair, a great sense of humor, and a high tolerance for poison ivy. But, I also got the fact that I am a hot sleeper (and that I snore) from him. Those two, I could do without. Two years ago, I got a Marmot 15° bag for Christmas. I hadn't bought a new sleeping bag since summer camp in Middle School, so I had no idea that the mummy bags would make me as hot as they did. In the last two years I've learned a lot more about what my body needs to sleep comfortably outside, so I decided to make the transition to quilt. Quilts are basically open-backed sleeping bags. When you're laying down in a normal sleeping bag, you're compressing half of the down (or synthetic) insulation inside. Since insulation works best when there is air in it, this compressed half isn't doing much. You still need a sleeping pad to insulate you from the ground, anyways. The open-back design of quilts gets rid of the redundant weight and is a dream come true to side and stomach sleepers like me. Quilt overlooking Longs Peak on Memorial Day Weekend! I was a little hesitant about making the plunge; what if I got cold and wanted to snuggle deep inside a down cocoon? What if I hated this sleeping system? I'm supposed to be using a mummy bag, why can't I just learn to like it? 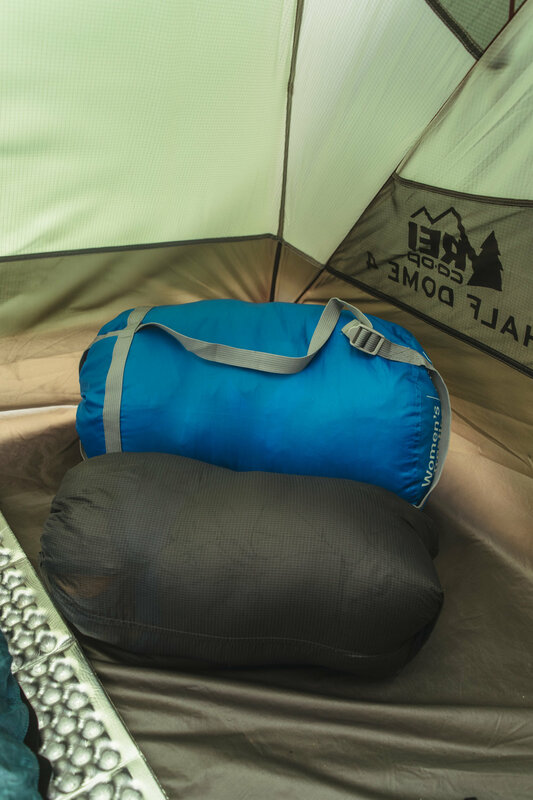 After reading every possible piece of information on the Enlightened Equipment website, finding other people's reviews of the bags, looking at other sleeping bag options, I realized that the quilt really was the right choice for me. I have the Enlightened Equipment Revelation: 950, 40°, regular. And here's the thing: I absolutely love it. The Revelation is their most popular quilt - it has a zippered footbox that can be cinched closed when it's cold, or opened up to lay totally flat like a blanket when it's warm. There's a pad attachment system (which, I will admit I have not used yet) that clips to each side of the quilt; this allows it to be cinched closed to keep out drafts when it's cold. There's also a cinch and a clip around the neck, which I haven't used camping but I have used to wear the quilt like a cape. It's made using 10D and 20D fabric that allows lightweight durability and water resistance. PLUS! Enlightened Equipment uses ethically sourced down that verifies that none of the down in their supply chain is acquired through live plucking or forced-feeding. Like, it doesn't get much better than that. Pardon my gross camp feet, but LOOK I can be snuggled inside AND have my feet out for optimal temperature control! There are lots of other quilts on the market, but Enlightened Equipment is the best out there, in my opinion. My quilt weighs in at a whopping 14.30 ounces (if you're not good at conversions, that's less than 1 pound). Obviously, with a temperature rating for 20° or 10°, it's going to weigh more because it needs more insulation, but these quilts are ultralight without sacrificing comfort or style. I've used my quilt on a few camping trips now and am always pleasantly surprised about how much I love it. In RMNP, I did pair it with my mummy bag (unzipped all the way to act like a quilt), but that's because it got down into the lower 30s and I didn't particularly want to freeze. In Black Canyon of the Gunnison National Park, I was able to use the bag by itself, with the footbox loosely cinched so I could stick my toes out if I got too hot. I was so comfortable all night on both of these trips, it was amazing. The quilt stuffs down to HALF the size of my mummy bag, and puffs back up so nicely once I take it out. Size comparison: my Marmot bag is in the blue stuff sack. It's lightweight, it's beautiful, and I am finally comfortable with my sleeping situation. I don't think I'll ever be able to go back to a traditional bag, and I am already saving up my money to get another. What I would do differently next time: I would get a 20° bag with the wide width. Living in Colorado I definitely need something a little warmer for most of the year (I am a hot sleeper, so the 40° bag is perfect for summer - I could not have done a 30° one). The regular width is actually great, but I think if I were going to get another one, I would get those extra 4 inches for optimal snuggle opportunities.